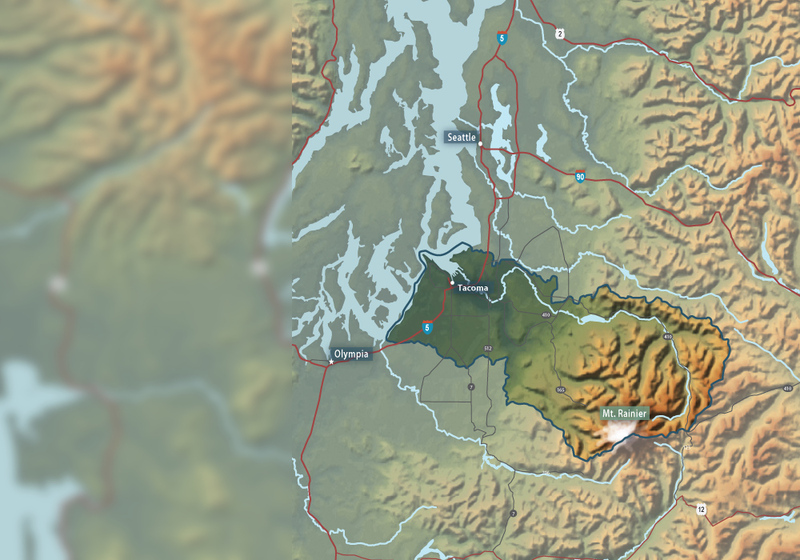 The Puyallup and two major tributaries, the White and Carbon Rivers, are glacially born on the flanks of Mount Rainier. 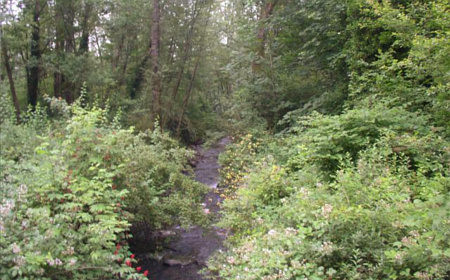 Groundwater fed Clover Creek drains to Steilacoom Lake, also the origin of Chambers Creek which then drains to Chambers Bay. We pursue the recovery of White River spring Chinook, Puyallup River fall Chinook; Puyallup, White, Carbon River, and Chambers Creek steelhead; and Chambers Creek coho. 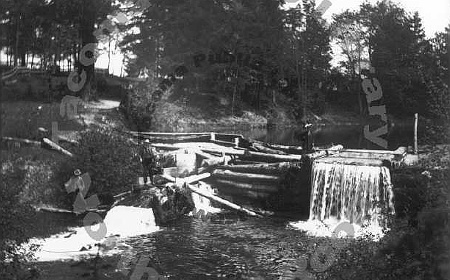 The original dam on Spanaway Creek was built in 1894 on the site of a furniture factory. A 1.7-acre pond is behind the dam, today, bordered by private homes and Bresemann Forest. The dam was rebuilt in 1953. 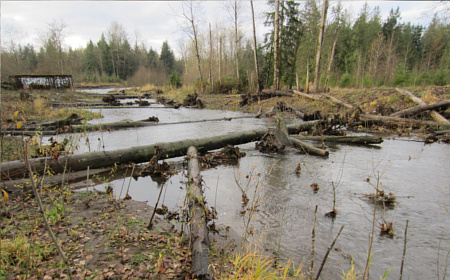 Still a barrier to fish, it prevented steelhead and coho from migrating upstream to valuable habitat in Spanaway Lake and Coffee Creek Wetlands. 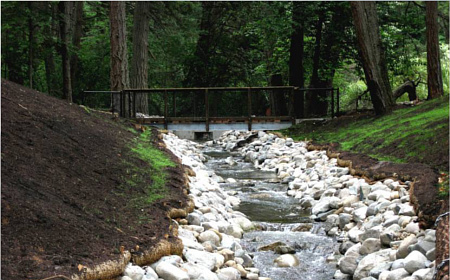 After a public decision making process,the dam was kept to preserve the wetlands and historic pond and a new fish bypass channel was built around the dam, in a historic stream path. 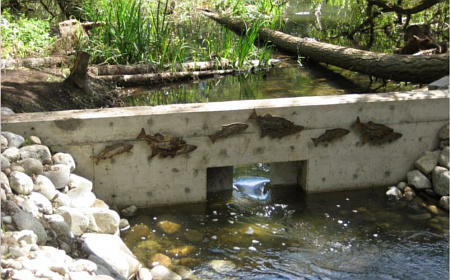 The Spanaway Creek fish passage project uses a boulder 'chute-and-pool' style bypass channel. 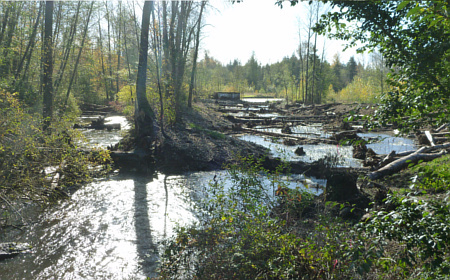 The new channel provides migrating fish access to approximately five miles of upstream habitat, including Spanaway Lake. 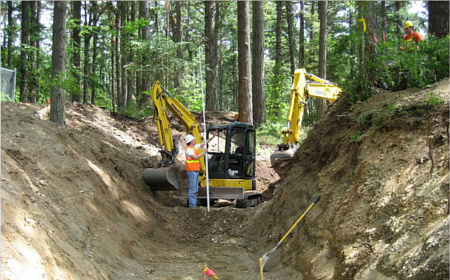 This picture slideshow walks the viewer through the progression of the project, starting with pre-project condition, through construction implementation, to post project success. 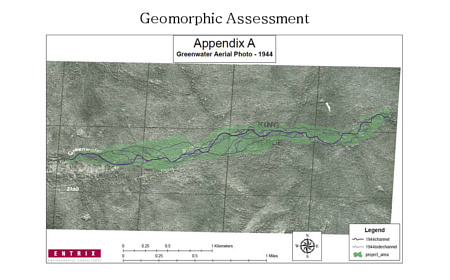 This digitized aerial photo shows the condition of the river in its pre-development condition. 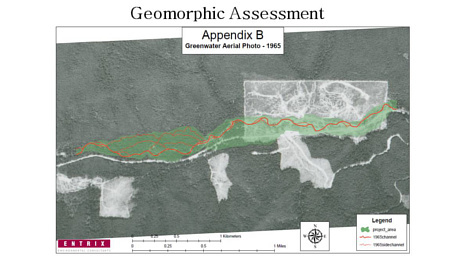 Note the many branching channels across the heavily forested Greenwater Valley floor. 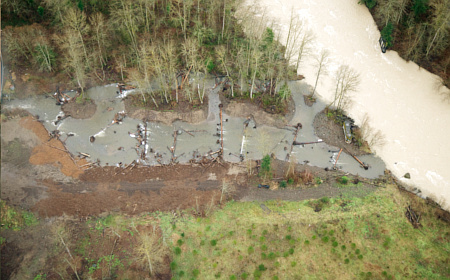 This aerial photo shows the condition of the river after the timber harvest and construction of forest roads in the Greenwater Valley. 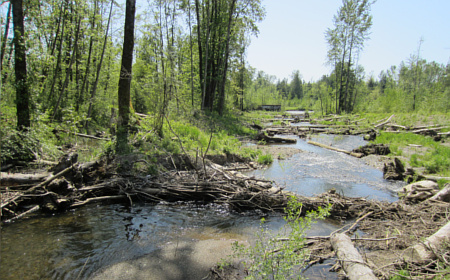 The branching river has morphed into a single channel with virtually no riparian structure. 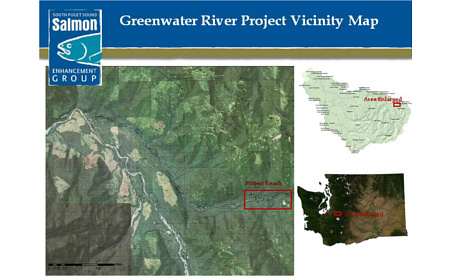 This map shows the location of the project within the watershed and within the State of Washington. 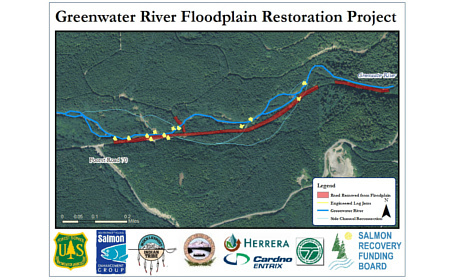 This maps shows the project design to remove nearly one mile of stream adjacent the road from the floodplain and install 13 engineered log jams. Also depicted across the bottom of the page are the many project partners. 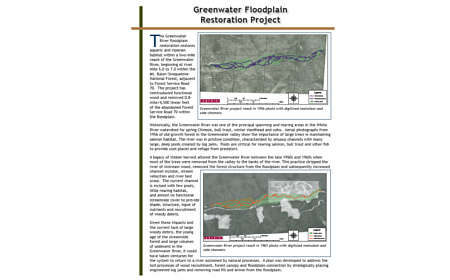 This pdf document is a 2-page informational sheet summarizing project need, goals, and benefits. This video shows pink and Chinook salmon migrating up Boise Creek in September 2011. Shade cloth was installed to keep the water cool. In the 1930's the lower 500 feet of Boise Creek was relocated between the Northern Pacific RR and SR-410, creating a channelized and over-steepened stream. This photo shows the Lower Boise Creek Project site immediately after construction. Note the new channel on the right and new logjams on the left. Large woody debris provides roughness so that Boise Creek can scour pools, form riffles, build terraces, and actively migrate. 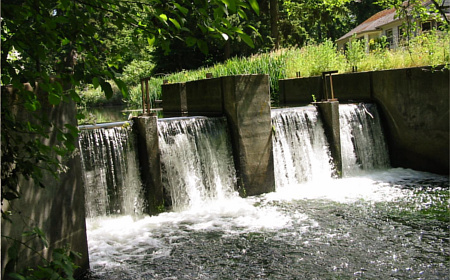 These features provide spawning, rearing and refuge habitat for Chinook, pink, coho, and chum salmon and other fish and wildlife species. Lower Boise Creek project January of 2011, during a flood on the White River. The site is on 15 acres situated along the left bank of the White River.